Preheat oven to 425 ˚F (220 ˚C). Line baking sheet with parchment paper. In bowl, toss together red pepper, onion, zucchini and eggplant. Reserve 1 tsp (5 mL) olive oil. In small bowl, whisk together remaining olive oil, paprika, salt, garlic powder, nutmeg, ginger, coriander, cloves and cumin. Drizzle over vegetables, tossing to coat well. Roast for 13 to 15 minutes or until tender-crisp; let cool slightly. Spray 18- x 12-inch (45 x 30 cm) sheet of heavy-duty foil with nonstick cooking spray. Unroll dough; place on foil. Starting at center, press out dough with hands to form 13- x 9-inch (33 x 22 cm) rectangle; brush with reserved olive oil. Preheat grill to medium-high. Grill pizza crust, turning once, for 5 to 8 minutes or until golden brown. Carefully remove from grill. 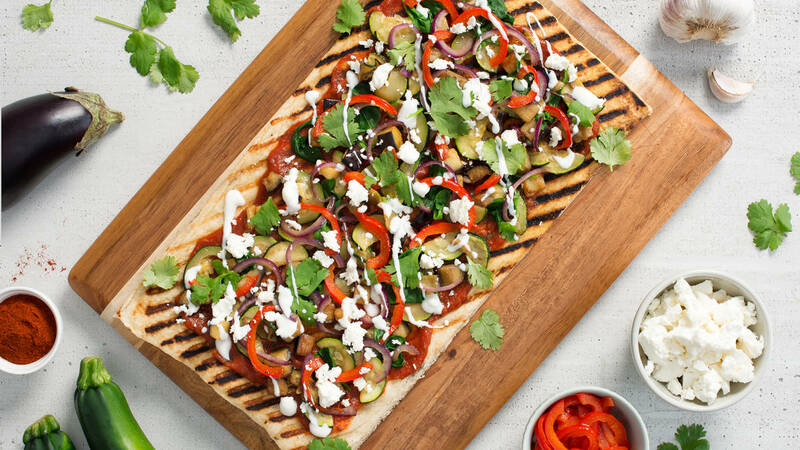 Top pizza crust with sauce, roasted vegetables, spinach and feta cheese. Return pizza to grill. Grill for 3 to 5 minutes or until crust is browned and thoroughly cooked, and cheese is melted. Carefully slide onto wooden board. Let stand for 2 minutes. Drizzle with yogurt and sprinkle with cilantro. Add browned ground lamb for a meaty version. Double the roasted vegetables and save the leftovers to enjoy as a side dish with grilled meats or to top a grain bowl.